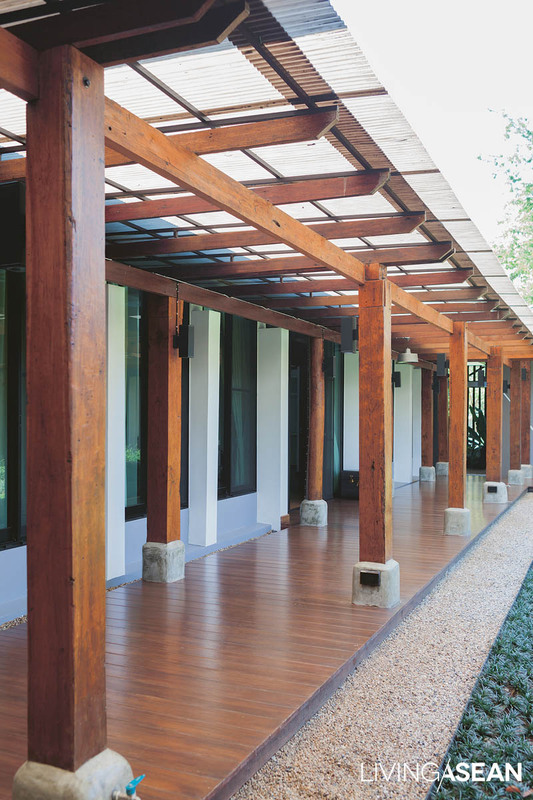 A wood deck is designed to take in the view of the courtyard landscape. 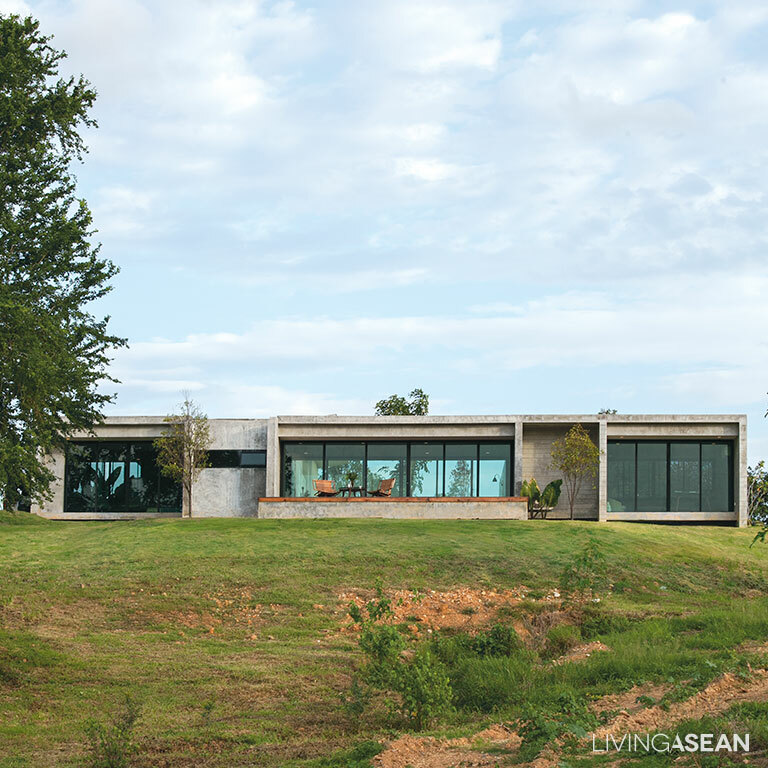 Like a must-have in any design, a healthy, lush lawn serves as the yard’s focal point. The grass lawn is uncluttered and easy to keep clean like those on the golf course. Underneath it, a drainage system is in place to carry off excess water, thereby preventing flooding in case of rains and getting rid of mosquito breeding grounds. 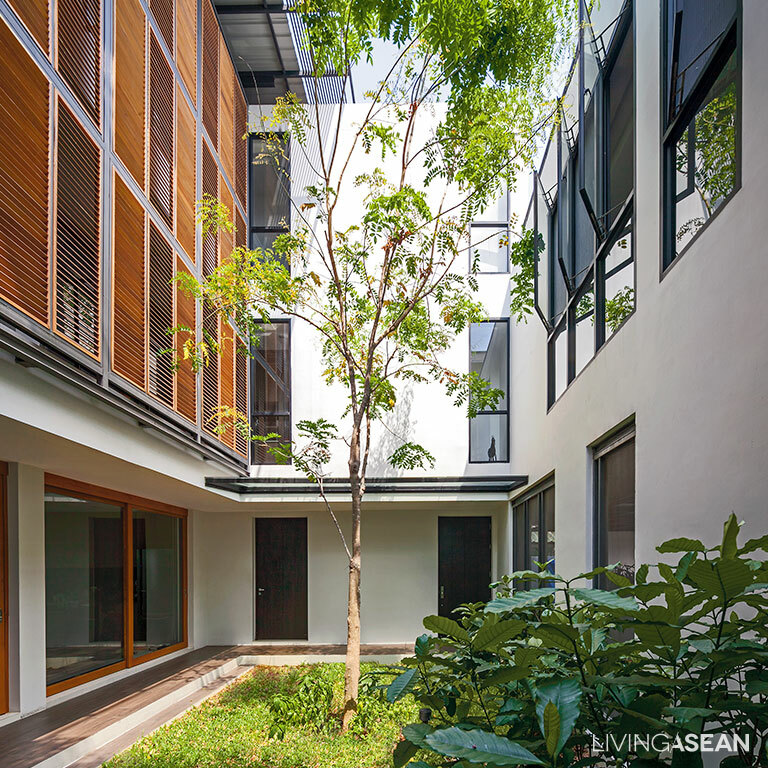 From this angle, the rectangular-shaped inner courtyard can be seen enclosed by a walkway system that connects everything on the property. A set of stairs leads to the entrance of the building. Nearby, a ramp is put in place as part of a preparation for possible future events should a wheelchair be needed. Only a short distance away, an Indian cork tree (Millingtonia hortensis) thrives in a round container. 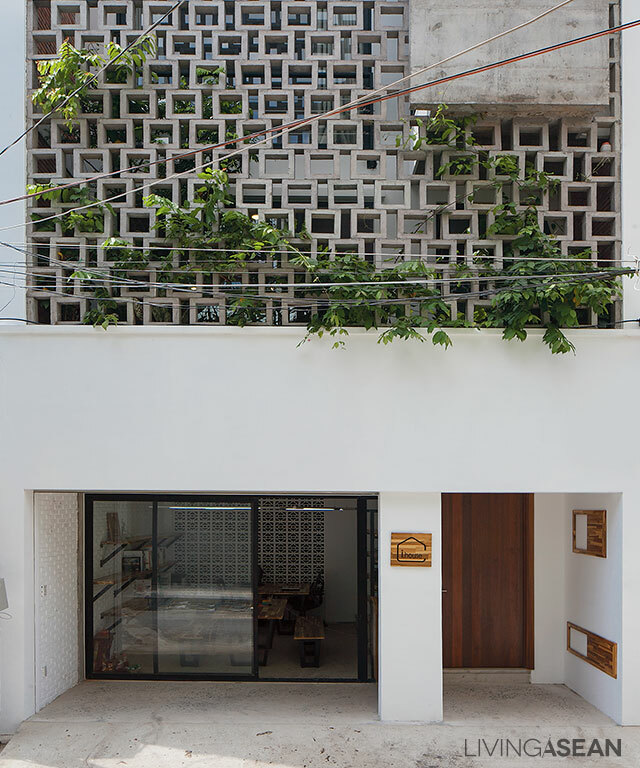 It has since grown through the skylight that’s purposely built to brighten a nearby carport during daytime hours. The Swiss chalet-style building had been a family home for more than thirty years. Eventually it was in need of repair and restoration. 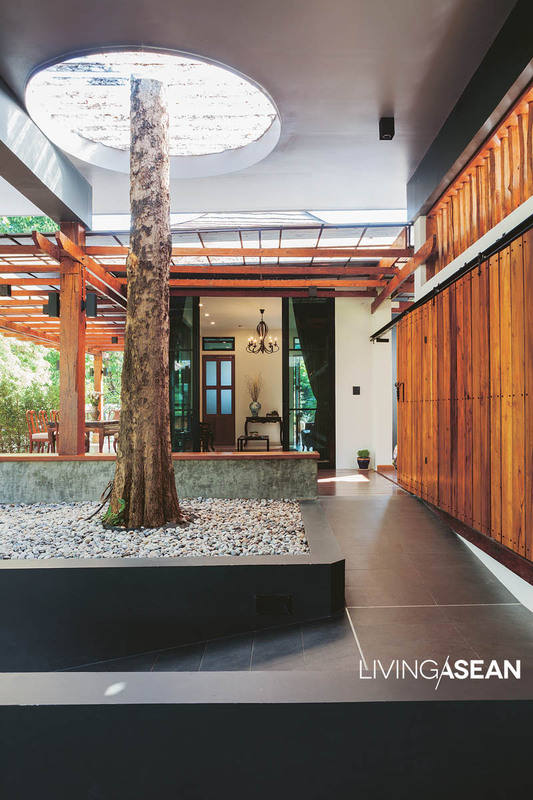 The Panikabutra family gave serious thought to renovating and returning their two-story wooden home to its original condition. All things considered and when a decision had to be made, the homeowners thought it wise to have it demolished to make room for a new home. 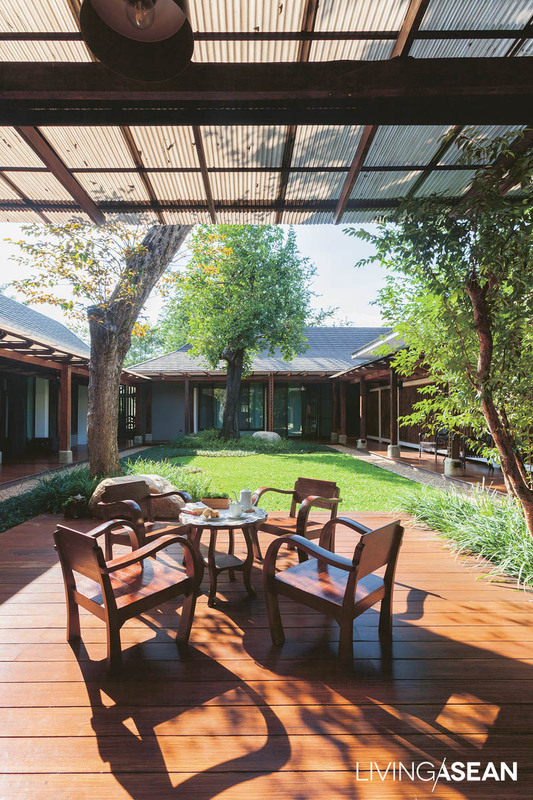 Reclaimed wood from the old house was prepared for reuse in a new single-level building designed for mother, Khunying Pannang Panikabutra. 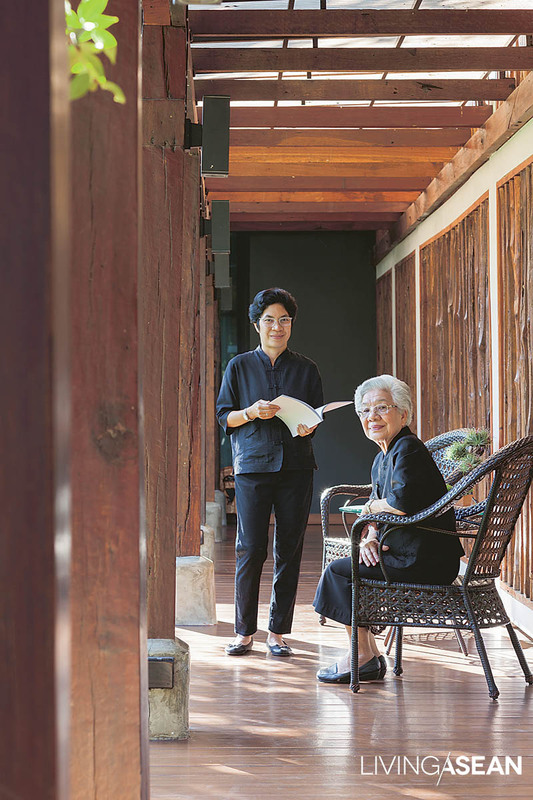 Her daughter, Thapanant Suwittayalangkarn, shared the story behind it. 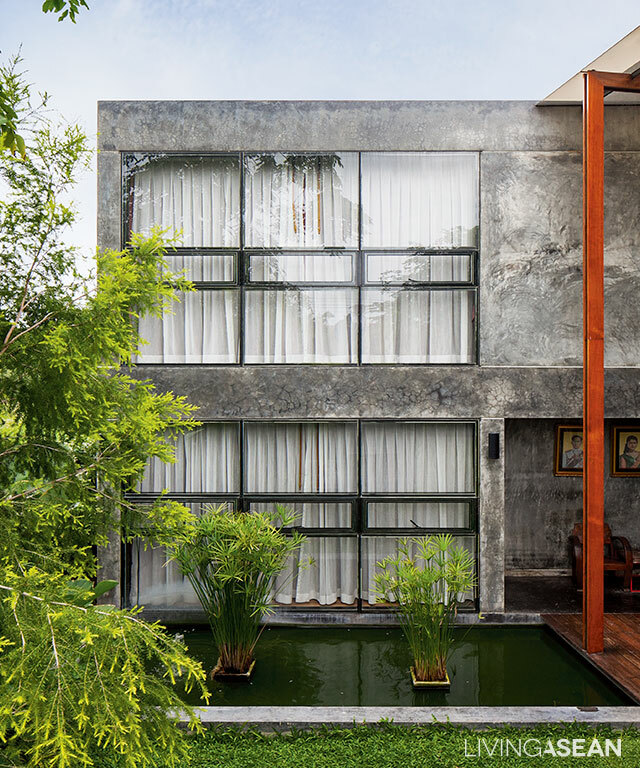 The reception room boasts large opening glass doors overlooking the central courtyard. 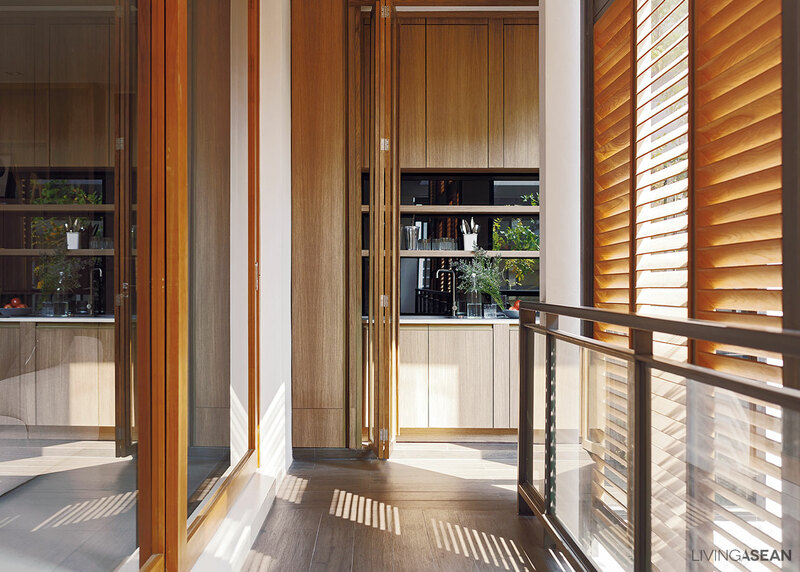 At the further end, two doors with matching transom windows add a light and airy feel to the atmosphere. 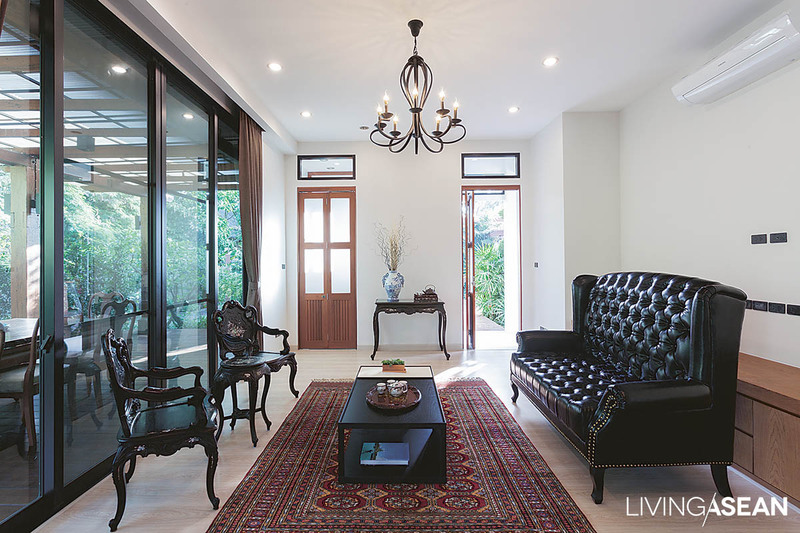 In the middle of the room, despite its rather formal appearance, a vintage-style waiting room sofa in dark hues seamlessly fits into the décor. 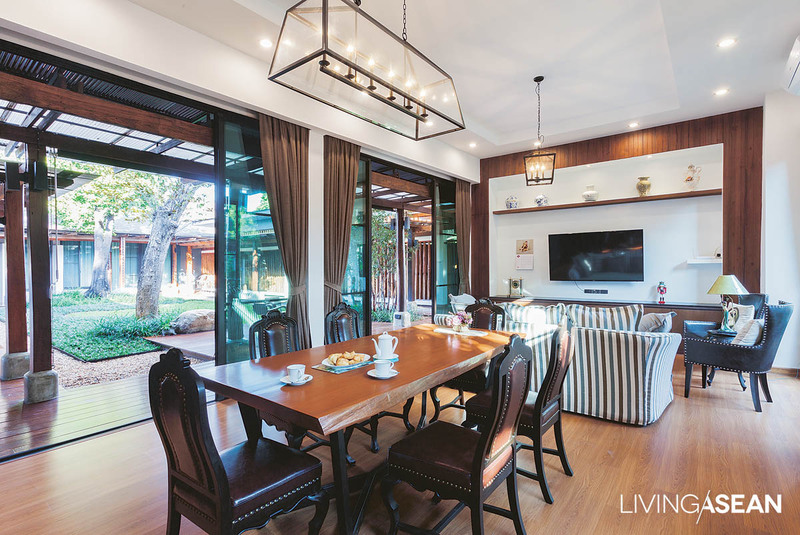 The dining room and nearby sitting parlor get a good view of the inner courtyard, thanks to large opening doors that stand tall from floor to ceiling. Soft hues on the sofa upholstery creates a calm and serene atmosphere to make one feel more relaxed. It’s easy to get why this area has become the family’s favorite hangout. 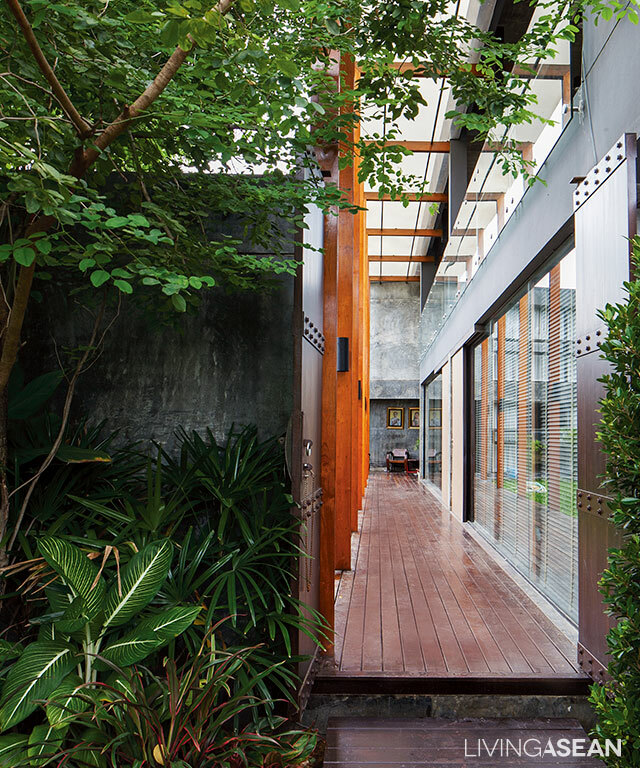 The walkway around the courtyard is roofed over with translucent sheeting to shield it from sunlight and rains. 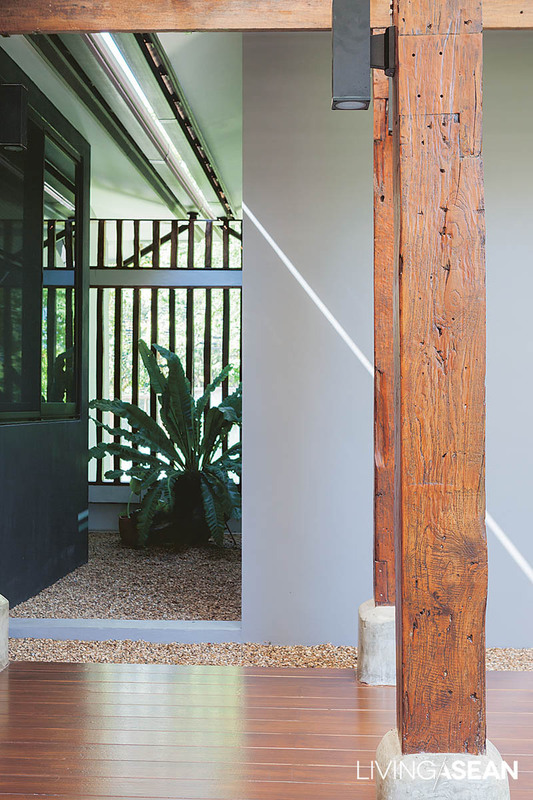 The rafters and roof battens are made of reclaimed wood from the old house, while the posts are erected on cement foundations to protect against humidity damage. The passageway surface is covered in a mixture of small stones to prevent water splashing in case of rain. 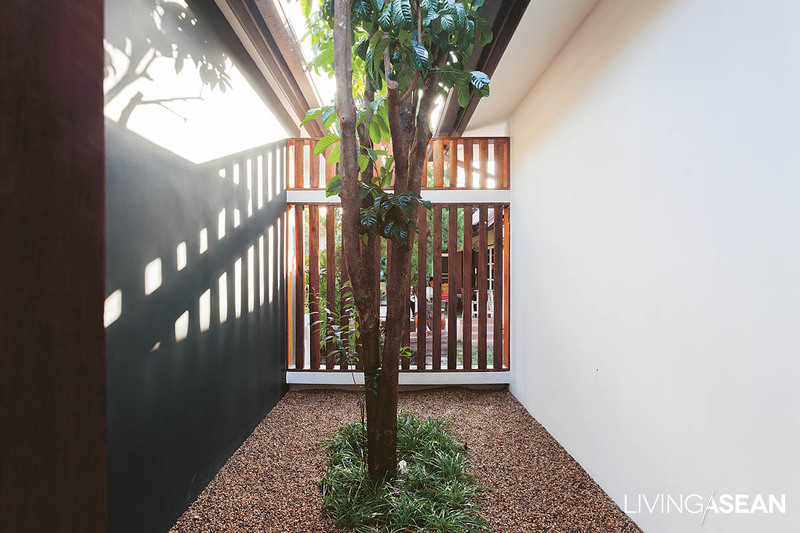 they create a spectacular light and shadow play that’s constantly changing with time. 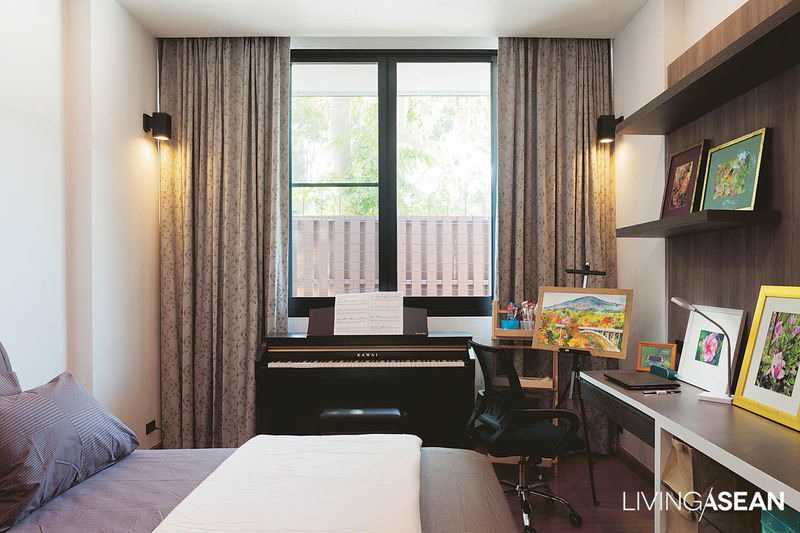 The bedroom offers a relaxed corner for leisure activity, such as drawing and playing music. 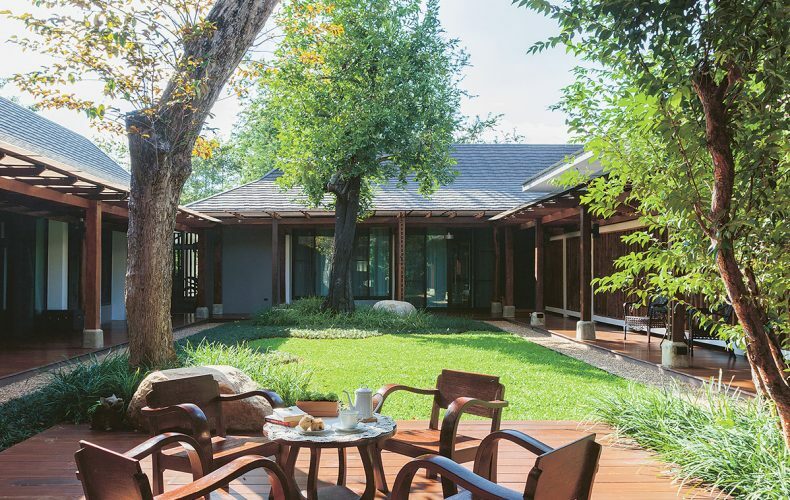 Mom and daughter relax together in a sitting area around the courtyard. 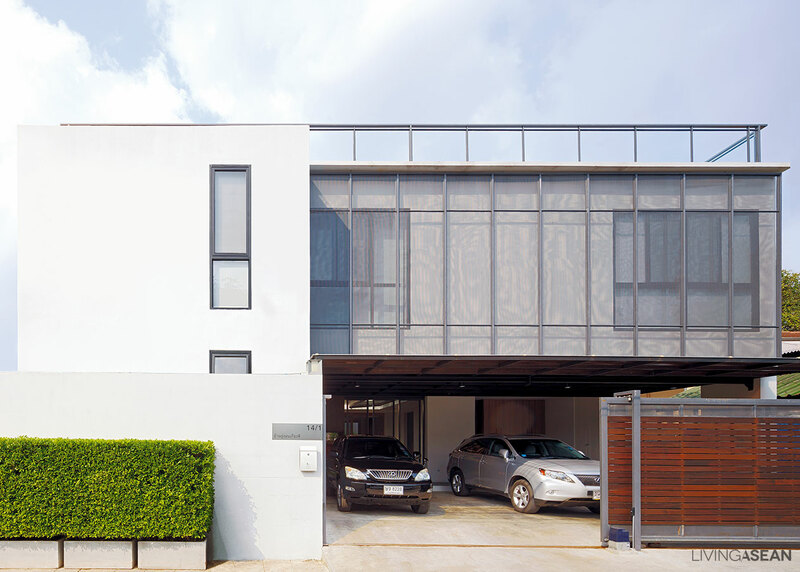 What kind of design suits hot and humid weather? 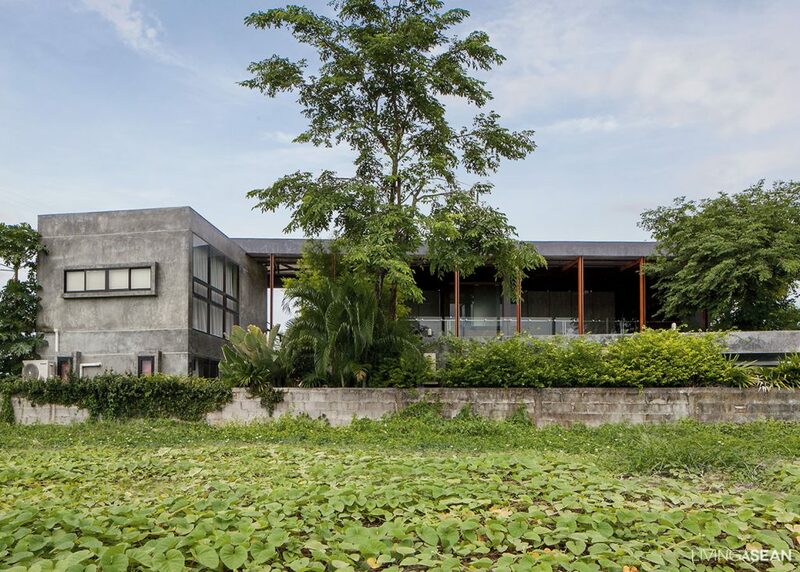 Many concrete houses are the ones to answer this region’s common question. 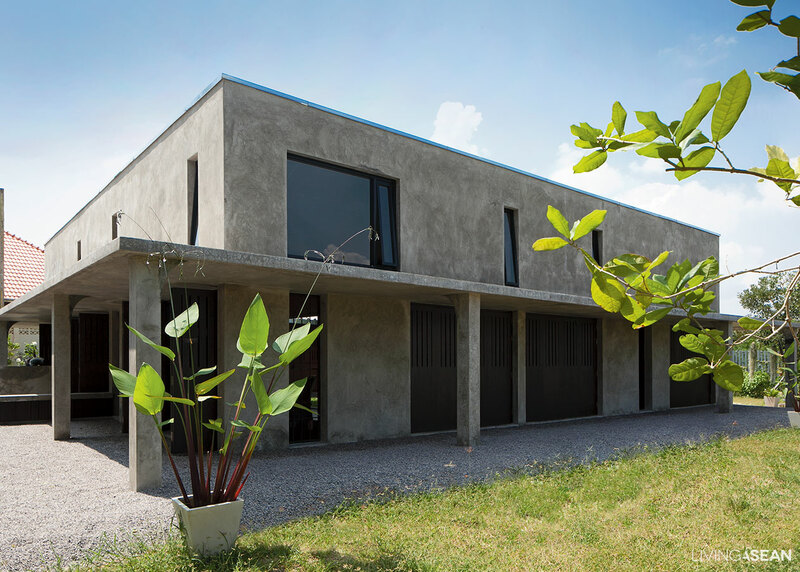 The raw concrete home-office house has truly interpreted the meaning of ‘everyone’s home’. 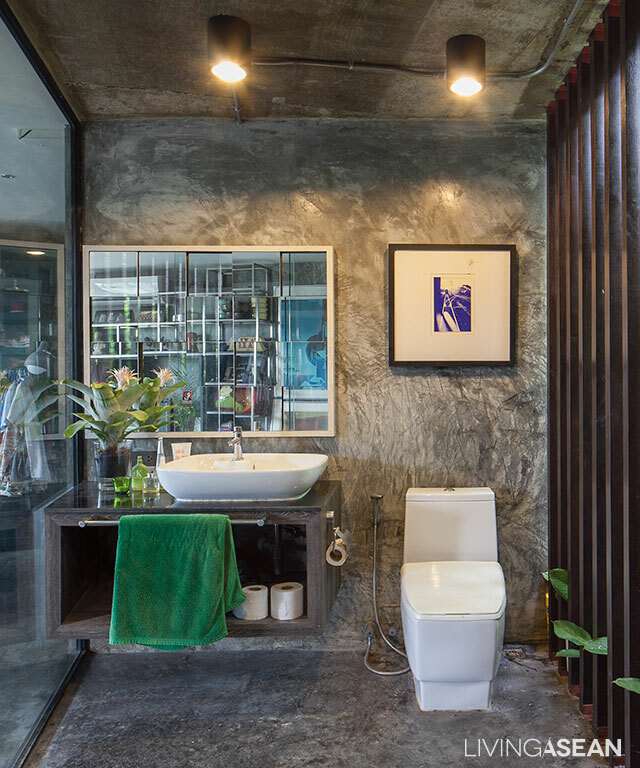 With its unique design, each family member has also taken part in adapting their lifestyle to the home design while intervening the multi-purpose space for everyone. 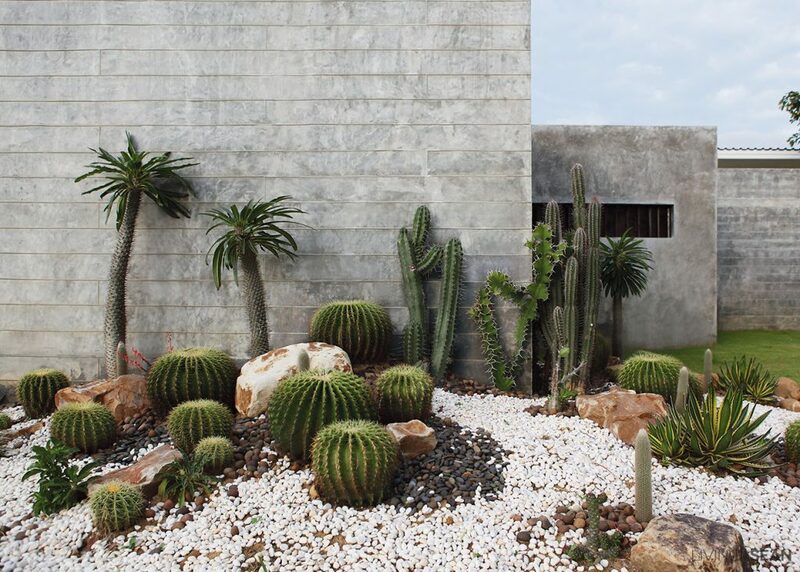 It’s vital to build your weekend home, harmonizing with nature. 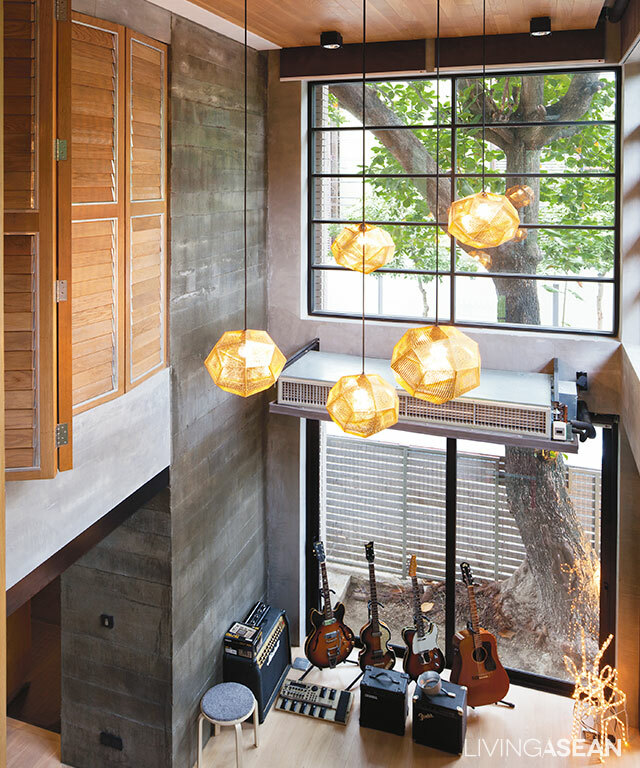 Although the house style is modern, but you can let all materials show the raw texture without any decoration. Blending with the natural environment. 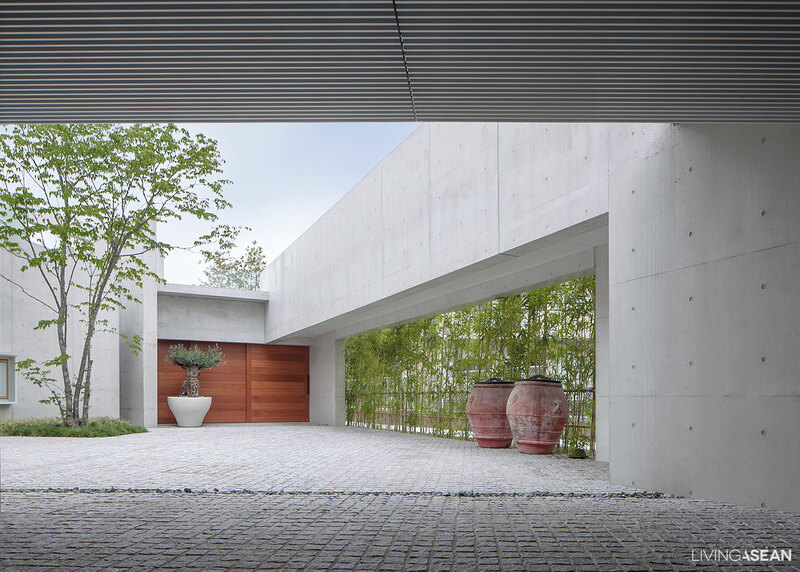 Now, the new concrete house space design is developed from the Thai-traditional house planning which plants the tree in the center court of a house and encircles with porch and four corners. 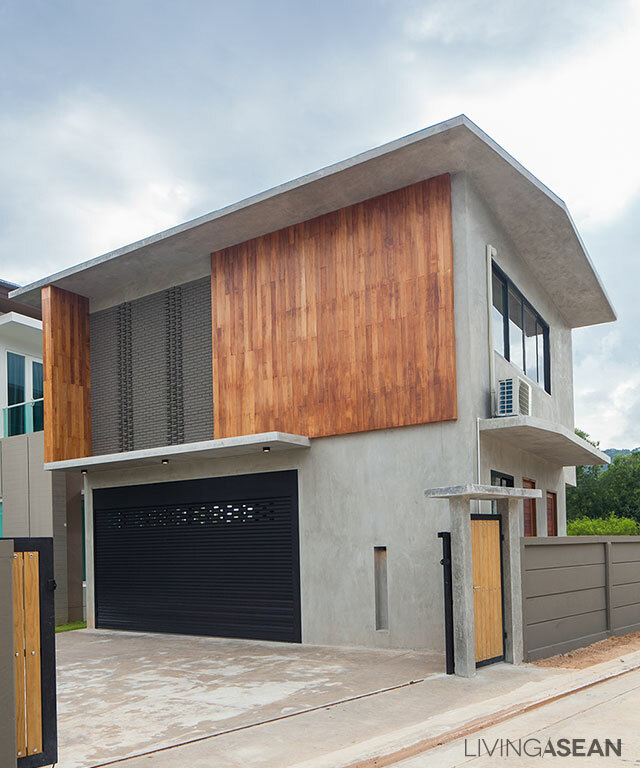 This design will adapt to the comfortable concrete home style along with every detail of Thai house that was given the new perception of contemporary style. 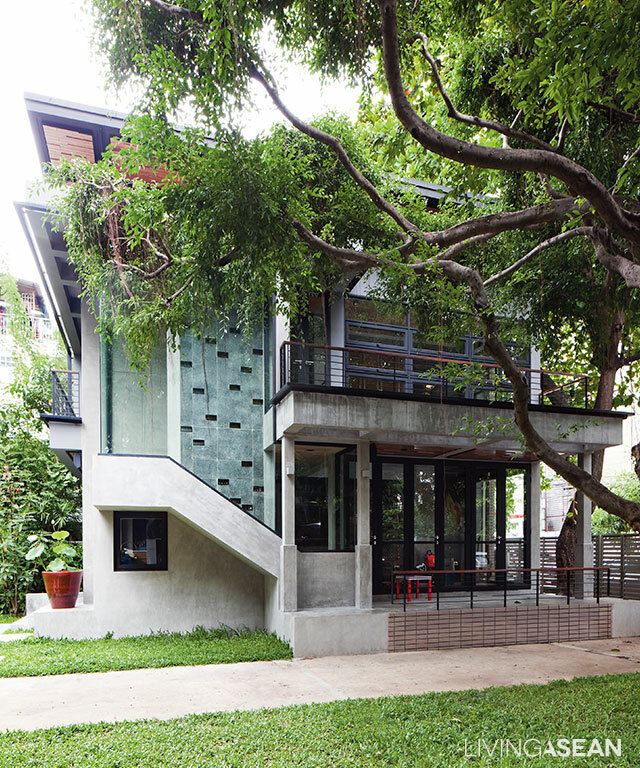 This compact concrete house makes us feel the essence of Thai house, but it is free from any types of roof. 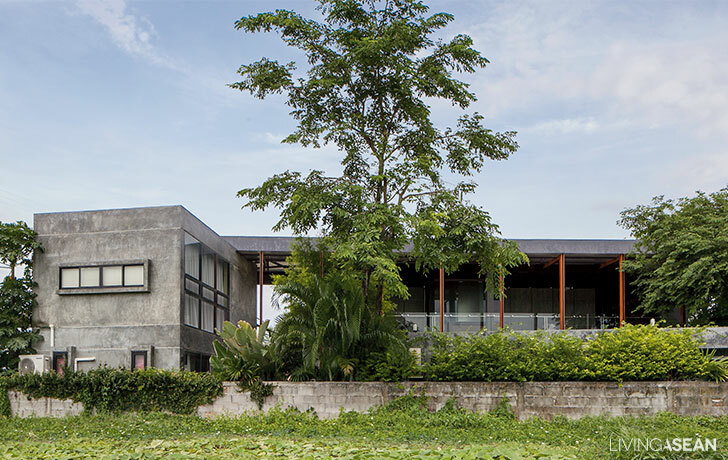 The only thing they need from building this house is to live in this humid climate atmosphere without using air-conditions or turning the lights on. 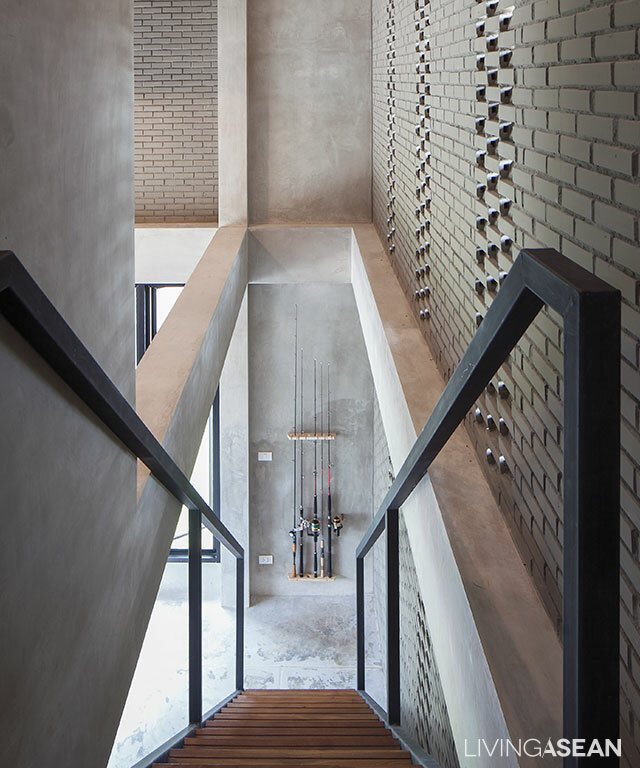 Now, the architect can create the new modern loft concrete house by adapting traditional house’s platform in both upstairs and downstairs. 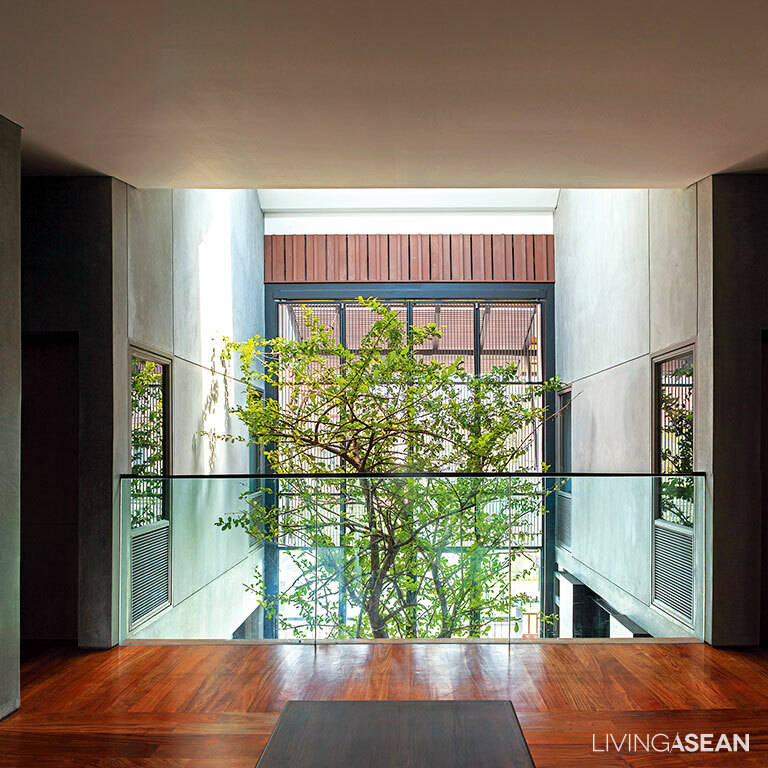 The downstairs can connect with the living room when opening the sliding glass doors that can help extend another useful space, while the upstairs also use the window with the Thai-style awning. 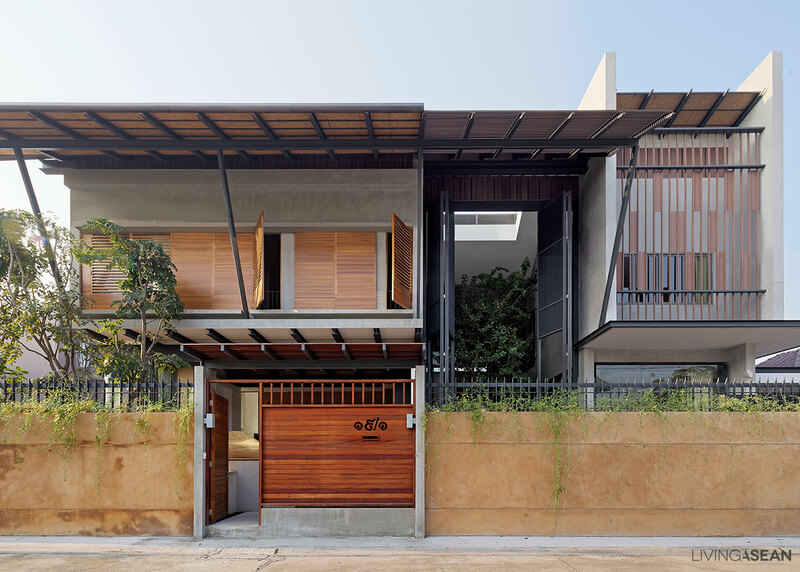 Design: Vorapong Teerakawongsakul, M.O.L. studio Co.,Ltd. 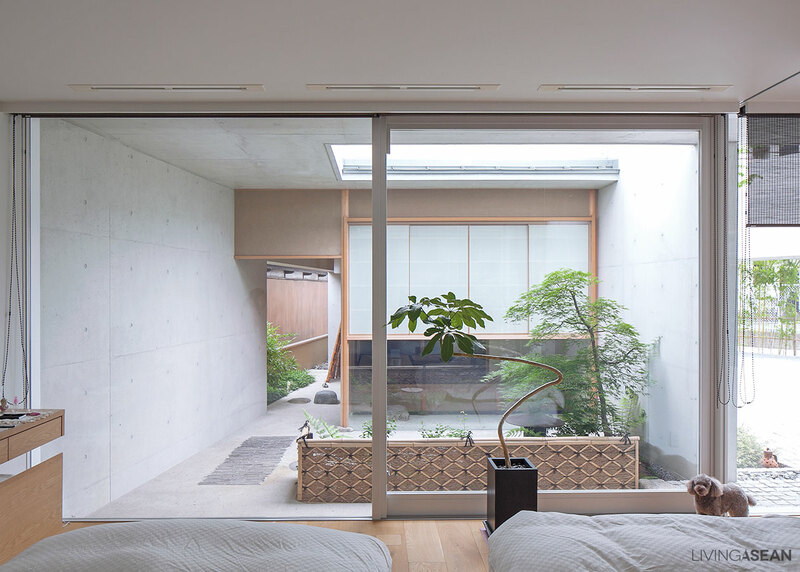 A box concrete house with simple and modern style can harmoniously contain every detail of Japanese way. 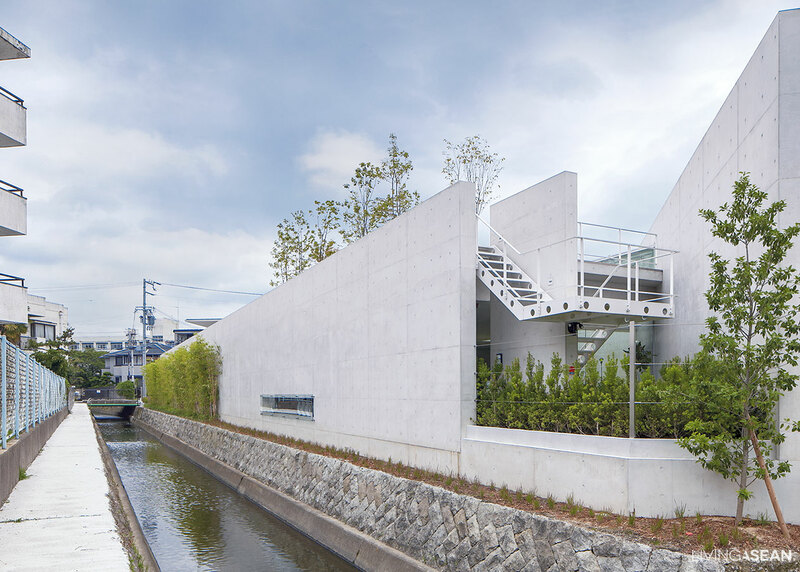 The architect invented new formula of white concrete to enhance its unique minimal style. 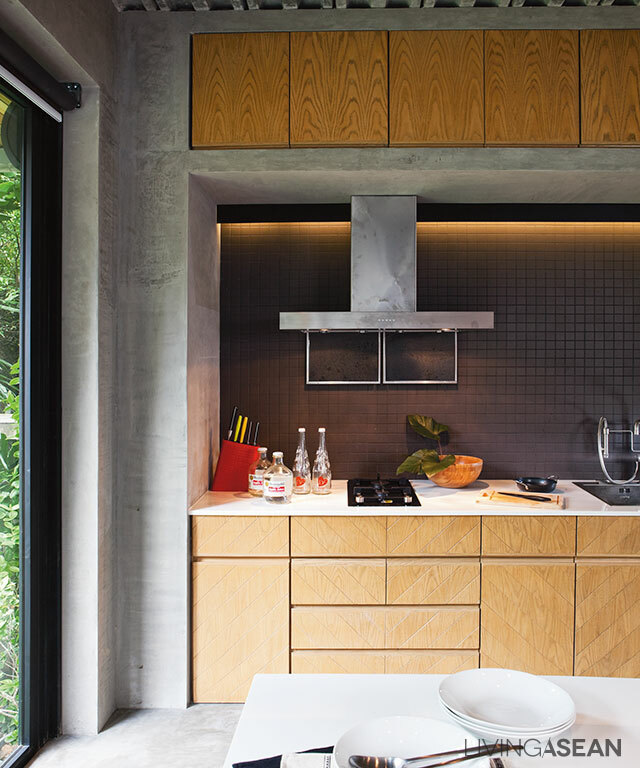 The tiny concrete house called ‘Mancave’ separates from the big house. 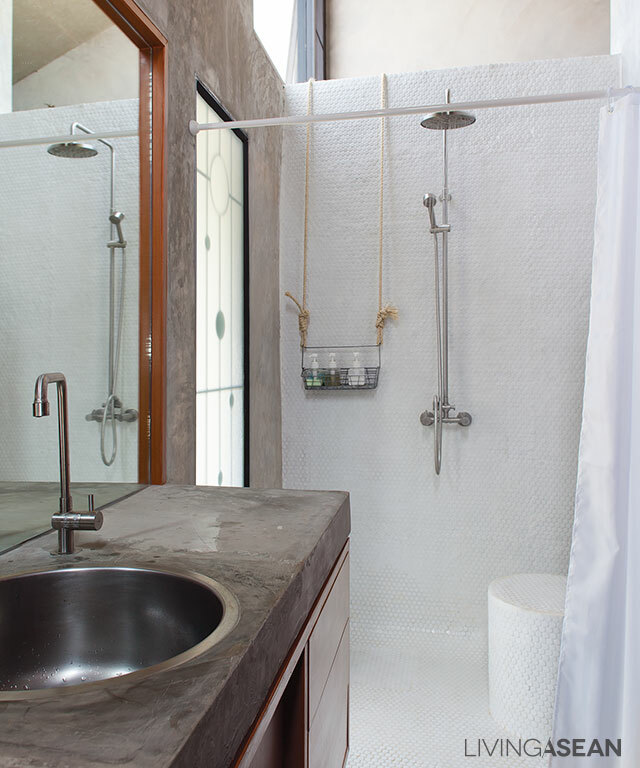 The owner intends to have all the facilities for as same as the big one to serve his works and hobbies. 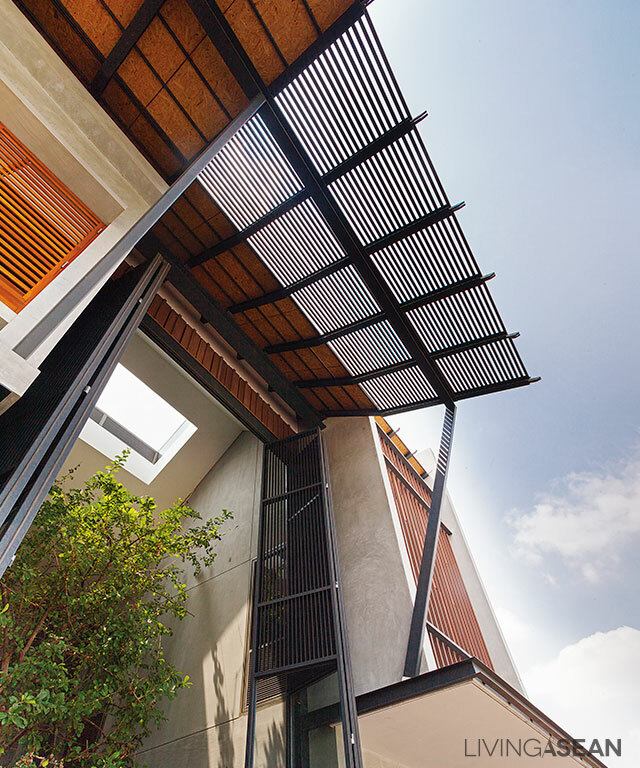 Design: Kamron Suthi, Eco Architect Co.,Ltd. 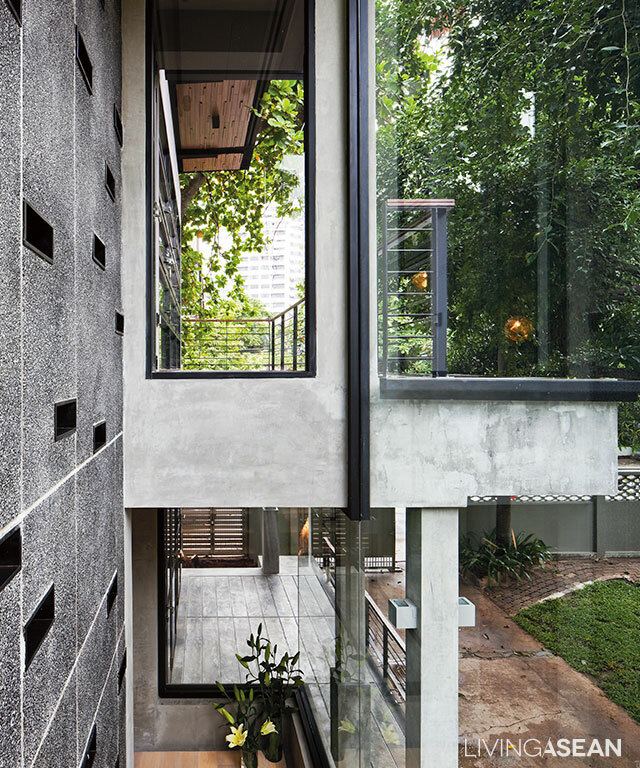 The white concrete house in box-shape, Sukhumvit area has given the simple and stunning look among many ordinary houses. 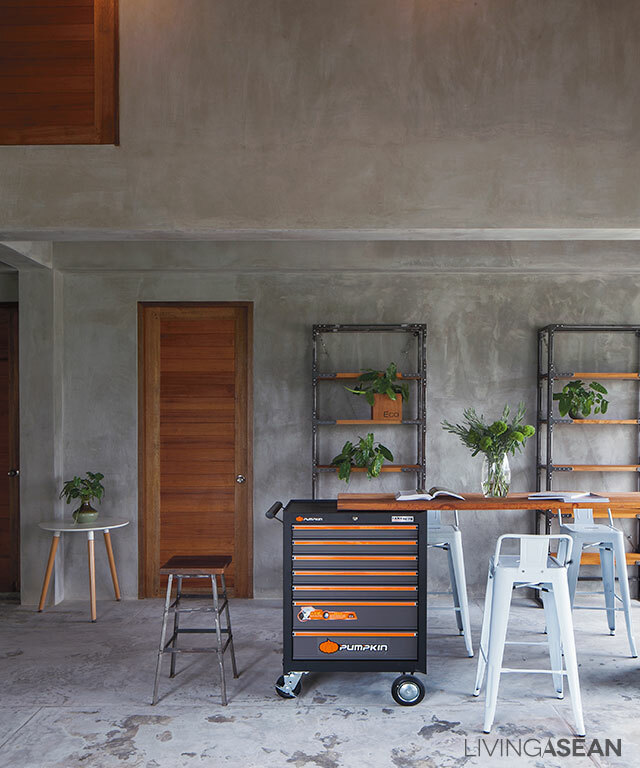 With its smart concept, this house can prove the modern style that can respond to our needs and friendly to all of everyone. 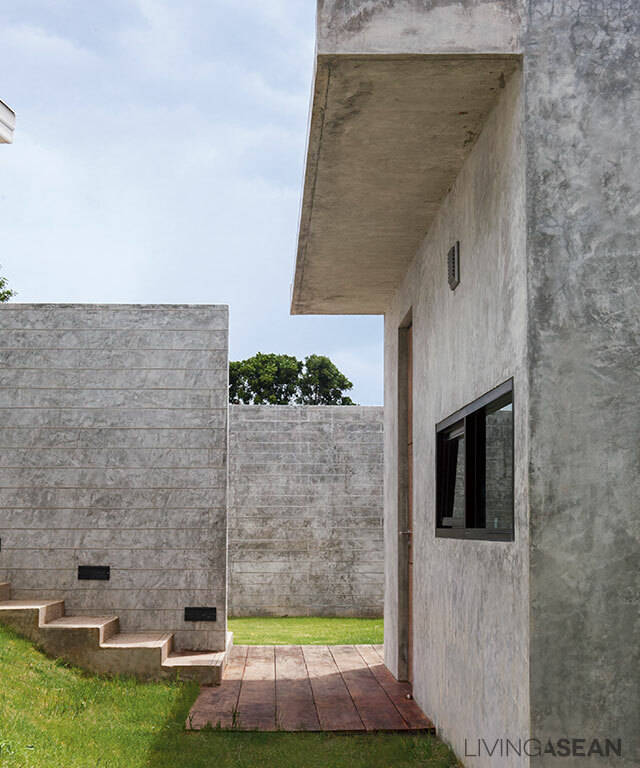 Concrete block house, the modern design for the owner’s parents. 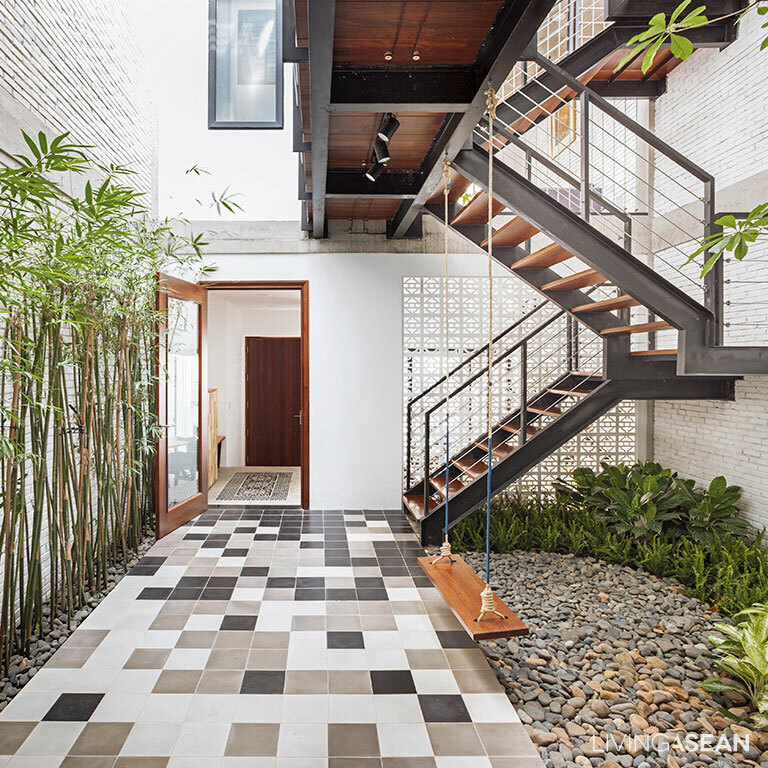 They can do a lot of activities with their children in this cozy space. 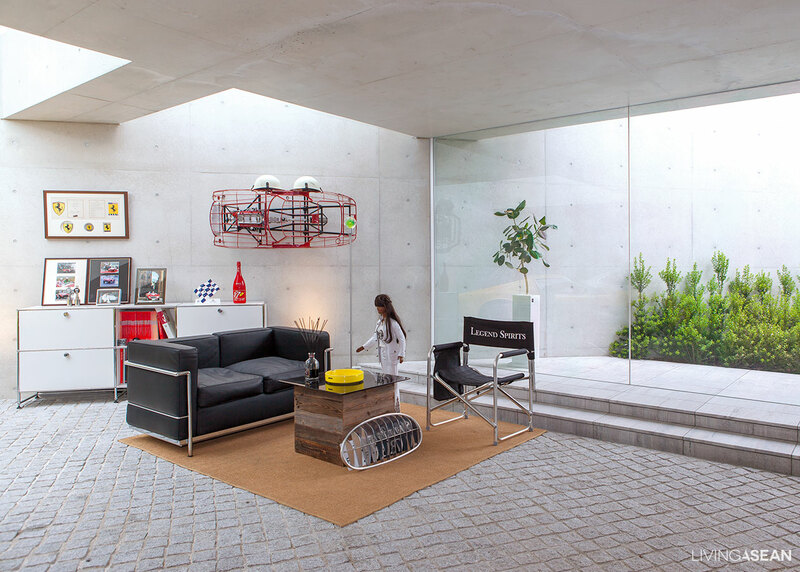 Design the wide green open space in the center of a house for every family’s member usages.